Learn about the prophetic significance of Jerusalem’s Eastern Gate with Dr. David Reagan and Nathan Jones on the show Christ in Prophecy. Last aired on November 7, 2010. Dr. Reagan: Did you know that the Eastern Gate in the Old Walled City of Jerusalem is one of the key symbols of end time Bible prophecy? Did you know that the gate as it stands today is a fulfillment of a prophecy recorded over 2,000 years ago in the book of Ezekiel? Did you know that even Orthodox Jews believe that one day the Messiah will return to Jerusalem through this gate? For a fascinating study of how the Eastern Gate relates to the soon return of Jesus, stay tuned. Dr. Reagan: Greetings in the name of Jesus, our Blessed Hope, and welcome to Christ in Prophecy! Now, those of you who are regular viewers are undoubtedly surprised right now about our new set. This is our first program to feature it, and we are very excited about it. We believe it is going to give us a look that will be more appealing to young people, and we believe it is going to supply us with greater flexibility to communicate our message that “Jesus is coming soon!” I want to take this opportunity to thank all of you who have given sacrificially to make it possible for us to acquire this new set. We are a ministry that has always operated on a cash basis because we believe that we should not go into debt in order to preach and teach God’s Word. We are debt free, for which we praise the Lord and extend our thanks to those of you who the Lord has worked thru to help us financially. Now, regarding this new set, there is one item missing from it that always got a lot of attention on our old set. And it is this clock, I am sure that those of you who are regular listeners are familiar with this clock. On our old set this clock always set on a mantle behind me in the background. And the clock drew a lot of attention because it always showed the same time, namely, 11:59. We constantly received email messages, and letters and phone calls asking, “Why don’t you wind your clock?” Or, “Do you know your clock is stuck on 11:59?” Well, of course, we were very aware of that because the clock was a symbol of a truth that we emphasize on this program over and over again. And that is the truth that we are living in the season of the Lord’s return. Or, as I like to put it, we are living on borrowed time. I say that because the signs of the times are literally shouting that Jesus is at the very gates of Heaven waiting for His Father’s command to step out on a cloud and return for His Church in an event called the Rapture. We have replaced this symbol with a new one that communicates the same message, and in a moment I will introduce you to that new symbol. But first, I’d like to give this trusty clock a formal retirement with a song by Jack Hollingsworth. Jack has been our featured singer on Christ in Prophecy since we began broadcasting in 2002. Here now is Jack singing the song “11:59.” It has been powerfully illustrated by our great media crew headed up by our Media Minister, Larry Watts. Dr. Reagan: Welcome back to Christ in Prophecy. Wasn’t that a great song, and didn’t our media staff do a great job of illustrating it? In a few minutes, I’m going to share with you another song by Jack that has also been powerfully illustrated by our media team, but first, I want to introduce you to the new symbol on our set that proclaims the soon return of Jesus. Its right over here, what you see here is an incredible photograph of the Eastern Gate in Jerusalem. It was taken by Todd Bolen who is the foremost photographer of the Holy Land today. Todd is the one who takes the photos for the Holy Land calendar that we produce each year. If you are not familiar with Todd’s great photos, which you can purchase on CDs, then go to his website at BiblePlaces.com. There you’ll find thousands of photos of Jerusalem, the Galilee, and all other areas of Israel, plus scenes of many other areas in the Middle East. Now, I mentioned earlier that this accent photo of the Eastern Gate is our substitute symbol for the clock we had on our old set because it, like the clock, is a symbol of the soon return of Jesus. Let me explain what I mean. In June of 1967, during the Six Day War, I was serving as a professor of international law and politics at a college in Texas. Those were the days before the Internet, so I had to keep up with daily developments in the war thru television and newspaper reports. Shortly after the war ended, I read a newspaper report that brought my attention to the Eastern Gate and to Bible prophecy. It also radically changed my life. But before I tell you what was in that report, let me give you some background information. What I have here is an outline of the Old Walled City of Jerusalem. A very deep ravine called the Kidron Valley runs north and south on the east side of the city. And across the ravine is where the Mount of Olives is located. Over here you see in this blue area the Temple Mount it is shaped like a trapezoid. And down here this red area indicates what is called the Western Wall or the Wailing Wall. Approximately in the center of the Temple Mount there is a building called the Dome of the Rock, it is a Muslim shrine. And some believe the Dome of the Rock is where the ancient Jewish Temple was located. Now the Old City is divided into four divisions according to those who occupy it. The quarters are: the Arab quarter located here, the Christian quarter here, the Armenian quarter here, and the Jewish quarter over here, close to this red line that indicates the location of the Western Wall or the Wailing Wall. Now there are eight major gates to the Old City, and they are located as follows: the first and most important one that we are discussing in this program is the Golden Gate, or the Eastern Gate, the only external gate that gives access to the Temple Mount. Directly north of it, at this point is the Lions Gate. And it is also referred to as St. Stephen’s Gate since it marks the traditional site where Steven was martyred. Up here along the northern wall are three gates the first is the Herod’s gate that goes directly into the Arab Quarter. The Damascus Gate is located here in the center of the northern wall and it is given that name because it faces the road that led to Damascus in the time of Jesus. The Damascus Gate is the largest and most beautiful of all the gates of Jerusalem. There is a third gate on the northern wall. It is located here. It is called the New Gate and it is called that because it was cut in the wall in 1898 to provide direct access to the Christian Quarter by Christian pilgrims. On the Western side of the city there is only one gate. It is called the Jaffa Gate because it faces the road that leads to the port of Jaffa. Now there are actually two Jaffa gates, the ancient one, is shown in this particular picture. But adjacent to it, is the newer Jaffa gate, which consists of a large cut in the wall. The cut was made in 1898 to make it possible for Kaiser Wilhelm II of Germany to ride into the city in his carriage without having to dismount and walk. Royalty really does have its privileges! Now on the south side of the city there are two gates. The first one is located here on Mt. Zion and is appropriately called the Zion Gate. It provides direct access into the Jewish Quarter. The pock marks you see all around the gate are the result of fierce fighting that took place here in the 1948 War of Independence. The other gate on the south side of the city is located here near the Western Wall. And it is called the Dung Gate. It provides direct access to the Western Wall where the Jews worship. The name of this gate comes from the fact that in ancient times it is the gate that was used to remove garbage and animal waste from the city. Now, when the Six Day War broke out in June of 1967 the dividing line between Israel and Jordan ran like this. It came from the North jetted over to the west and came straight down. That meant that Israel was on this side and the Jordanians on that side and that meant that the Jordanians controlled all of the Old City of Jerusalem. So the Jordanians expected that the Israelis would attack from the West hitting the Jaffa Gate. And therefore they concentrated all of their fortifications and their troops at that point. However the Israelis knowing that they expected that surprised them by sending troops around to the Eastern side of the city under the cover of darkness where they launched an attack at the Lion’s Gate. The attack was successful. The Israelis broke into the city, captured it quickly, and then they rushed to the Western Wall to pray. It was an extremely emotional moment because it meant that the Jews were back in control of their city for the first time in 1,897 years all in fulfillment of end time Bible prophecy. Dr. Reagan: Welcome back to our discussion of the significance of the Eastern Gate in end time Bible prophecy. Now, with the background I have provided, I think we are ready to consider the newspaper article I read about the Six Day War that literally changed my life. The article said that the Jewish military leaders had engaged in a heated debate the day before the attack on the Lion’s Gate because someone had suggested that they attack, instead, by blowing open the Eastern Gate, which would have been even more surprising to the Jordanians. According to the report I read, there was an Orthodox Jew present during these discussions, and he told the military commanders that they could not blow open the Eastern Gate because it had to remain shut until the Messiah returns. Now that comment caught my eye and it fascinated me. What in the world was he talking about? I had no idea. So I got a concordance and I looked up in the concordance the word Eastern Gate and I started running scripture references. It did not take me long to find Ezekiel 44. In that section of Ezekiel, the prophet is being given a tour of the future Temple to be built in Jerusalem in the end times. And in the process, it is pointed out to him that the Eastern Gate will be closed and will remain closed until the Messiah returns. I had gone to church all my life and I had never once heard about that particular prophecy. I next turned to the Encyclopedia Britannica and I started reading about the Eastern Gate. I discovered that it was closed in the 1500’s when the Muslim leader, Suleiman the Magnificent, rebuilt the walls of Jerusalem that stand to this day. The intriguing thing is that no one knows for certain why the gate was bricked up. 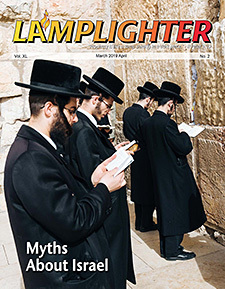 The tradition is that while the walls were being repaired, a rumor swept the city that the Jewish Messiah was coming. Suleiman called in the Jewish rabbis and he asked what this rumor meant. They explained that the Jewish Scriptures prophesied that one day God would send a Messiah who would come from the East. He would enter the Eastern Gate and he would rid the city of all the enemies of the Jews and would then begin to reign over all the earth from Jerusalem. According to the tradition, Suleiman thanked the rabbis, dismissed them, and then ordered that the Eastern Gate be closed and that a Muslim cemetery, as you can see, be placed in front of the Eastern Gate. Because he felt like that no Jewish Messiah would ever be able to step into a Muslim cemetery, and he certainly could not walk thru a gate that had been bricked up! I was captivated by this discovery, and I realized that the Eastern Gate is a fulfillment of Bible prophecy. Just as prophesied in Ezekiel 44, the Eastern Gate is closed and it will remain closed until the Messiah returns. Psalm 24 describes how it will be blow open supernaturally to welcome the Messiah when He appears. Psalm 24:7 says, “Lift up your heads, O gates, and be lifted up, O ancient doors, that the King of glory may come in! Who is the King of glory? The Lord strong and mighty, the Lord mighty in battle.” Well every time I go to Israel, the first thing I want to see is the Eastern Gate. To me it is proof positive that the Bible is the Word of God and that Bible prophecies can be trusted and can be interpreted literally. It is also a reminder of the promise of Jesus that one day very soon He will return. Let’s pause now for another song by Jack Hollingsworth. This one is titled “We Shall See Jesus.” It is my favorite song by Jack. It is marvelously illustrated by our media crew, including an image of the Eastern Gate. It is a song about three hills and their significance in the life of Jesus. It builds up to an incredible finish. Listen to it carefully, and you will be blessed. Dr. Reagan: Welcome back to Christ in Prophecy. I don’t know about you, but that great song gives me goose bumps from beginning to end! Well, folks, here we are sitting on the third part of our new set, where we hope to conduct many fascinating discussions of Scripture. And here with me is my colleague Nathan Jones, who serves as our Web Minister and as an associate evangelist. Nathan, tell our viewers why we decided to put a world map back here on this particular part of our set. Dr. Reagan: Thanks, Nathan. You know, folks, in ancient times it was believed that the earth was the center of the universe. A Polish astronomer by the name of Nicolaus Copernicus challenged that concept in 1543 when he published a book arguing that the Sun, and not the earth, was the center of the universe. His idea was picked up by another astronomer, Galileo Galilei, who was from Italy. Galileo became a champion of the theory of Copernicus, and in 1632 when he published a book defending the theories, he was subjected to the Inquisition. Galileo was found “vehemently suspect of heresy,” and he was forced to recant, and he spent the rest of his life under house arrest. You know, Nathan, the claim that the earth was not the center of the universe proved to be true geographically. But not spiritually right? Nathan Jones: Well that’s correct Dave. Folks the Bible clearly teaches that this earth is the center of the universe spiritually, for it is the focus of God’s plan of redemption. It is on this planet and in the city of Jerusalem that God’s Son, Jesus, died for our sins. And it is that same city of Jerusalem that Jesus has promised to return and reign over all the world. Dr. Reagan: Let me show you an ancient map of the world that emphasizes the point that Nathan just made. This map was produced in 1581 by a German cartographer by the name of Heinrich Bunting. He knew the world was not shaped like this, but he was also a professor of theology, and he drew it this way to illustrate the biblical teaching that Jerusalem is the center of the earth spiritually. Nathan, tell our viewers exactly where in the Scriptures it is prophesied that the Messiah will return to Jerusalem. Nathan Jones: Oh, Certainly. You can find that prophecy in Zechariah 14. The passage says that when Jerusalem is about to fall to the Antichrist and his forces in the end times, the Messiah will return to the Mount of Olives in Jerusalem. It says that when His feet touch the Mount, a great earthquake will split the mountain in half. And He will speak a supernatural word, and the Antichrist and his forces will be instantly killed. And in verse 9 it says that on that day He will begin to reign over all the earth from Jerusalem. Dr. Reagan: Incidentally, folks that is the reason the Mount of Olives is covered with tens of thousands of graves. 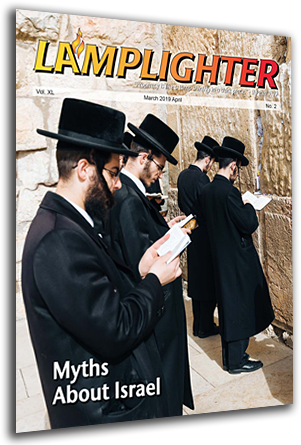 The Orthodox Jews may not believe in Jesus as their Messiah, but they do believe the prophecy of Zechariah 14 that their Messiah will come to earth on the Mount of Olives. Therefore, they desire to be buried on that Mount so that they will be the first to be resurrected. So, the Eastern Gate looks out not only over a Muslim cemetery at its base, it also overlooks the Mount of Olives filled with thousands of Jewish graves. Dr. Reagan: Well, here we are back on the set where I started this program. I hope the program has been a blessing to you. And I hope too that it has helped to open your eyes to the marvels of Bible prophecy, and I hope it will serve to motivate you to study God’s Prophetic Word. Please don’t forget the message of our old clock here and the message of the Eastern Gate. We are living on borrowed time, because Jesus is about to return. One hundred years ago there were no tangible, measurable, definitive signs that pointed to the Lord’s soon return. Today, they are everywhere. Nathan Jones: The most important signs are those that relate to the nation of Israel, for Israel is the cornerstone of end time Bible prophecy. Four prophecies in particular clearly identify our day as the time of the season of the Lord’s return. They are the worldwide regathering of the Jewish people to their homeland, which started in the 1890’s and continues to this day. Second is the re-establishment of the Jewish state which occurred on May 14th, 1948. And the third is the re-occupation of Jerusalem which happened on June 7th, 1967. The fourth is one that is being fulfilled right now. It is the prophecy that in all the end times the nations of the world will come together against Israel over the issue of who will control Jerusalem. Dr. Reagan: And folks those are not the only end time prophecies being fulfilled in these days. Two others I would mention are: The resurrection of the old Roman Empire in the form of the European Union, something the prophet Daniel predicted over 2,500 years ago. And the other is the rapidly growing apostasy in the Church which the Apostle Paul predicted would happen in the end times. Nathan Jones: Folks, we have a resource that will help you to understand end time Bible prophecy. 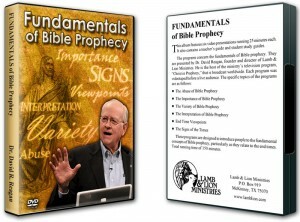 It is this DVD album entitled, “The Fundamentals of Bible Prophecy.” It contains two DVDs which in turn contain six 25 minute teaching sessions that provide an overview of the fundamentals of Bible prophecy. 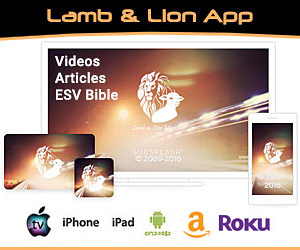 Specifically, the six lessons cover the following topics: The Abuse of Bible Prophecy, The Importance of Bible Prophecy, The Variety of Bible Prophecy, The Interpretation of Bible Prophecy, End Time Viewpoints, and The Signs of the Times. One of the discs that comes with the album also contains two files that can be easily printed. One is a teacher’s manual. The other contains student study guides for each lesson. And this album can be yours for a gift of $25 or more, plus shipping. 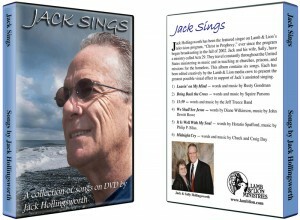 And, as a special bonus to celebrate our new set, we will provide you with this gift a DVD album called “Jack Sings.” It contains videos of six songs by Jack Hollingsworth, including the two songs featured on this program. To order this special offer, just call the number you see on the screen and request offer number 390. Call Monday thru Friday, 8am to 5pm Central time. Or you can place your order thru our website at lamblion.com. 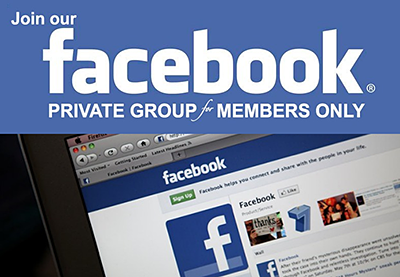 Either call our toll free number or access our website. Don’t miss this opportunity to get this album of six teaching lessons by Dr. Reagan and this album of six songs by Jack Hollingsworth, both for a gift of only $25 or more, plus shipping.